The Sorority believes that the knowledge we gain throughout our lives supports our ability to continue our engagement after graduation. One of the greatest opportunities to continue your membership is through volunteering. Alpha Sigma Alpha utilizes hundreds of volunteers annually to help support our collegiate chapters and alumnae. Our volunteers are essential to the success of our organization. There are many volunteer opportunities available that fit every alumnae’s stage in life that vary in time commitment, from a one-day commitment to an in-person weekly commitment. Volunteers can assist in a wide range of areas including advising collegiate chapters, supporting alumnae and assisting with national events. 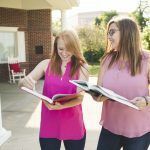 Most of all, volunteering for the Sorority allows members to network and build strong connections to members across the country. How do you get involved with Alpha Sigma Alpha? Please complete our volunteer interest form. This form will provide us with insight on your interests, talents and knowledge. Once completed you will be contacted by Ali Harris, volunteer coordinator. Have questions? Please refer to our volunteer frequently asked questions page.